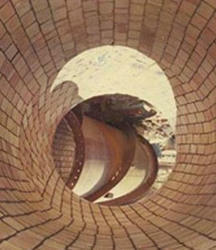 Chimney Refractory Lining solutions offered are solutions aimed for areas that lack masonry liner or have racked liner. Further, the services are also suitable for use in areas showing loose mortar joints/damaged brick work or those showing sign of creosote staining that can lead to potential fire hazard. Some of the standard features of our service include offering new refractory concrete lining support that provides for smooth as well as seamless acid-resistant flue surface; removing and cleaning the chimney of soot, cake, and any loose material so as to provide for solid base for new lining; solutions designed to successfully withstand action of abrasive/corrosive solids, liquids or gases at high temperatures among others. Every chimney that lacks a masonry liner or has a c racked liner, that has loose mortar joints or damaged b ri c k w o rk, or shows signs of creosote staining can be v i e wed as a potential fire hazard. Use of existing fire p l a c e chimneys to vent fireplace inserts or freestanding solid fuel heaters also frequently presents the risk of chimney f i res because the old fireplace chimney is usually too l a rge for safe, efficient operation of the add-on equipment. A new re f ra c t o ry concrete lining of the proper size can provide a smooth, seamless acid-resistant flue surface to remedy many of the problems cited. The process begins with a complete chimney swe e p that re m oves soot, cake, and any loose material. De t e rio rated tile liners are re m oved too. This provides a solid base for the new lining. All stoves and heaters are then detached and the flue openings are tempora rily sealed. One or more inflatable ru b b e ri zed tubes are inserted so that they pro j e c t f rom both the top and bottom of the chimney. Ava i l a b l e s t a n d a rd tubes can form flues from 3 to 12 inches in diameter and from 3x5 to 6x11 inches, elliptical. Stainless steel spacer springs are placed around the tube form so that the flue will be centered in the vo i d . Then the tube is inflated to create the properly size d opening for the flue. The rubber tubes tend to shorten as they expand to provide a uniform diameter thro u g h o u t their length. When deflated later the tube re t u rns to its o riginal longer length, making it easier to break away f rom the chimney. Any material can be described as a ‘refractory,’ if it can withstand the action of abrasive or corrosive solids, liquids or gases at high temperatures. The various combinations of operating conditions in which refractories are used, make it necessary to manufacture a range of refractory materials with different properties. 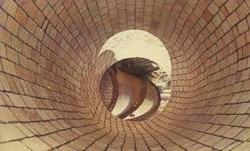 Refractory materials are made in varying combinations and shapes depending on their applications. Pure substances melt instantly at a specific temperature. Most refractory materials consist of particles bonded together that have high melting temperatures. At high temperatures, these particles melt and form slag. The melting point of the refractory is the temperature at which a test pyramid (cone) fails to support its own weight. The size and shape of the refractories is a part of the design of the furnace, since it affects the stability of the furnace structure. Accurate size is extremely important to properly fit the refractory shape inside the furnace and to minimize space between construction joints. The bulk density is useful property of refractories, which is the amount of refractory material within a volume (kg/m3). An increase in bulk density of a given refractory increases its volume stability, heat capacity and resistance to slag penetration. Furnace Refractory Lining solutions offeredare designed for use in furnace refractory and provide for stable working support for longer time duration. As leading manufacturers of refractory lining materials from Tamil Nadu, our rich domain expertise in this field allows us to deliver optimum end solutions as demanded by the customers. 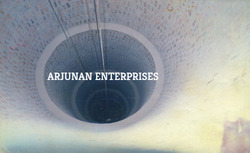 Some of the standard features of our products include quality finished chimney boiler refractive lining solutions; product finds usage in chimney areas lacking a masonry liner or has cracked liner; superior construction finish to withstand action of abrasive or corrosive solids, liquids or gases at high temperatures; products developed in different grades to meet various combinations of operating conditions where refractory is used. Chimney Boiler Refractive Lining Services offeredare handled by experienced industry professionals who have with them rich expertise and process knowledge to successfully handle the tasks of repairing laying new refractive lining of chimney boilers. Here, our team ensures making use of quality tested materials as well as advanced process technology support so as to ensure reliable and long lasting end results. Some of the service features include solutions designed to safeguard from any hazard due to cracked liners as well as provide for longevity of chimney; use of quality lining material to successfully withstand action of abrasive or corrosive solids, liquids or gases at high temperatures; option of utilizing refractory materials in varying combinations and shapes a per the specific application demands. Refractory Insulation Service offeredare handled by experienced industry professional so as to ensure high effectiveness and quality end results. Further, the use of quality material support in offered solutions also assure of its successfully withstanding action of molten metal slag, glass, hot gases as well as handling of load at service conditions. Some of the standard features of our services include solutions designed to withstand load and abrasive forces, conserve heat as well as have low coefficient of thermal expansion; solutions checked to ensure these do not contaminate material with which it comes into contact; rich domain expertise in handling services of chimney boiler refractive lining involving repairing or laying new lining where chimney lacks masonry liner or has cracked liner so as to avoid any type of fire hazard. An increase in bulk density of a given refractory increases its volume stability, heat capacity and resistance to slag penetration. Refractory Brick solutions offeredcomprise quality solutions that provide for remarkable working support in high temperature based refractory conditions. 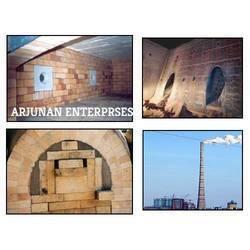 As recognized name in the field of manufacturing refractory bricks and leading supplier of the product in Tamil Nadu area, we ensure the chimney boiler refractive lining solutions offered take care of situations where chimney lacks masonry liner/have cracked liner. Some of it features include superior quality finish that make it provide superior withstanding action of abrasive/corrosive solids, liquids or gases; providing suitability for use in areas with high temperatures; support withstanding sudden changes of temperatures and others. Refractory Lining solutions offeredare handled by experienced industry professionals and have low coefficient of thermal expansion while supporting providing of optimum conservation of heat. Further, the bonding of the refractory materials is done to withstand high temperatures. 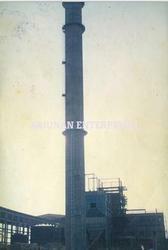 Some of its features include provides for increased volume stability, resistance to slag penetration and heat capacity; service provided for every chimney with lack of masonry liner/have cracked liner; quality refractory material based solutions for longevity of chimney; supports withstanding action of abrasive/corrosive solids, liquids or gases at high temperatures. Boiler Refractory Lining solutions offered comprise services handled by professionals who have with them rich experience and expertise in handling support for fixing of chimney boiler refractive lining. The service is suitable for chimney lacking masonry liner/have cracked liner that can lead to possible hazard. Further, our team ensures the solutions offered provide for longer service life and can handle at high temperatures action of abrasive solids, liquids or gases. Some of the service features include withstand sudden changes of temperatures and action of molten metal slag, glass, hot gases; withstand load at service conditions and abrasive forces among others. Looking for Refractive Lining Services ?